If you have any questions about the ELALDREA information page below please contact us. This motor yacht ELALDREA is a superyacht of well sized proportions. 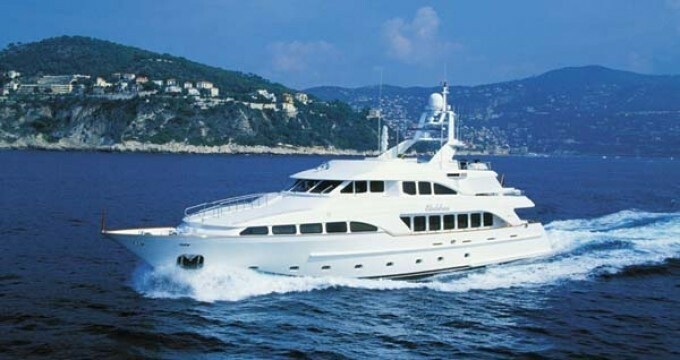 This 35 m (115 foot) luxury yacht was built at Benetti Yachts in 2002. Superyacht ELALDREA is a upscale yacht that is able to sleep a total of 10 passengers on board and has around 6 crew members. The naval architecture office which delivered the design work on the yacht is Fratelli Benetti and Stefano Righini. Zuretti Interior Design in addition was the one who saw out the overall interior design. 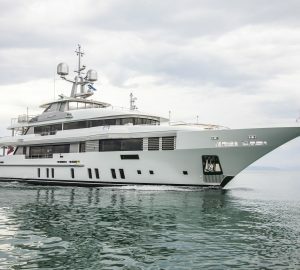 Motor yacht Elaldrea’s standard accommodation is for 10 guests in 5 cabins – owner’s suite, 2 double and 2 twins cabins (with an extra pullman in the starboard twin). However, she has quite a few exciting new features that will most certainly be installed in the Classics in order. The owner has decided to replace the Spa Pool in his bathroom with a very large walkthrough marble shower with steam jets. The rich variety of marbles used in the bathrooms go from Giallo Sierra, Afion, Rosso Alicante to Honey Onyx. The yacht's general design work came from Fratelli Benetti and Stefano Righini. 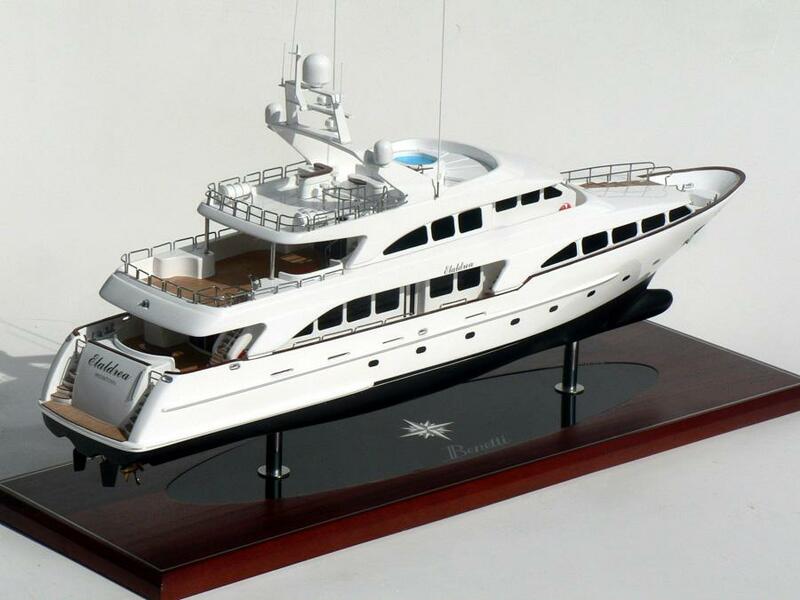 The technical naval architect firm intellectual property are a work of Fratelli Benetti Yacht Design. Motor Yacht ELALDREA received her elegant interior designing from the interior design company of Zuretti Interior Design. 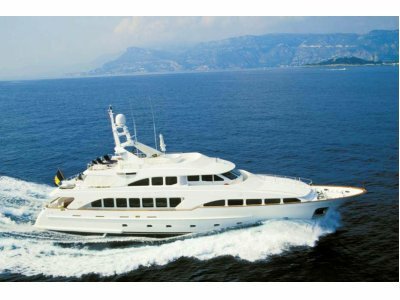 Italy is the country that Benetti Yachts built their new build motor yacht in. After official launch in 2002 in Fano she was then released to the happy owner following sea trials. A reasonable proportion is achieved with a maximum beam (width) of 7.62 metres / 25 feet. With a 1.95m (6.4ft) draught (maximum depth) she is reasonably shallow. The material composite was used in the building of the hull of the motor yacht. Her superstructure above deck is fashioned from composite. In 2005 extra refit work and updating was additionally finished. This ship posseses twin MTU main engine(s) and can find a industrious top speed underway of approximately 18 knots. The engine of the ELALDREA creates 1550 horse power (or 1104 kilowatts). Her total HP is 3100 HP and her total Kilowatts are 2208. ELALDREA is propelled by twin screw propellers. For stabalisers she was built with Koopnautic. Regarding bow thrusters she utilises Koopnautic. ELALDREA has a/an express cruise speed is 16 knots which gives a range of 3300. Apportioning bedding for a maximum of 10 welcome guests spending the night, the ELALDREA accommodates everyone in style. She also uses circa 6 expert qualified crew to run. 35 metres / 114.8 feet. The main engines are two 1550 Horse Power or 1104 Kilowatts MTU. The Model type is 12V 2000 M91 diesel. 16 nautical miles per hour. Kohler 2 times 65 kilowatts. She has a teak deck. The luxury yacht ELALDREA displayed on this page is merely informational and she is not necessarily available for yacht charter or for sale, nor is she represented or marketed in anyway by CharterWorld. This web page and the superyacht information contained herein is not contractual. All yacht specifications and informations are displayed in good faith but CharterWorld does not warrant or assume any legal liability or responsibility for the current accuracy, completeness, validity, or usefulness of any superyacht information and/or images displayed. All boat information is subject to change without prior notice and may not be current.